Greg, I don’t mean to sound cold, but we need to pursue this next review. We meet Nels Coxman (Liam Neeson), a snowplow driver in the mountain resort town of Kehoe, Colorado. Right after winning an award for “Citizen of the Year,” he is informed that his son Kyle (Micheál Richardson) has died from a heroin overdose. He becomes despondent and his marriage deteriorates. Just as he’s about to kill himself, he learns that his son was murdered by members of a large drug cartel. Coxman beats up a young friend of Kyle’s to learn the identity the guy who killed his son and he kills him and disposes of the man in the cold deep river where he’ll be sleeping with the fishes. To find the guys up the chain of command, Coxman consults his brother who (quite coincidentally) has retired from the very organization that was responsible for killing Kyle. Now Coxman is on a “death wish” to kill the guy at the top. Greg, Cold Pursuit is a semi-campy treatment of a genre that is always begging to be mocked. It surprises me that this movie isn’t listed as a comedy, albeit a dark one, as there is a morbidly amusing body count that grows exponentially during the course of the story. The film even keeps the tally for us. The dark comedic overlay of this movie is underscored at the end when an innocent paraglider meets his senseless demise by slamming into Liam Neeson’s snow removal truck. It’s not a bad way to wink at the audience and acknowledge the absurdity of it all. Fortunately, Cold Pursuit is more than just an absurdist look at the universe. Despite dark comedic overtones, Cold Pursuit is primarily a story of revenge wrapped inside a bloody gangster movie. Neeson is an upstanding citizen who curiously finds it easy to murder people who have wronged him. These murders are brutal and graphic, and Neeson’s preoccupation with comparing footballers John Elway and Eli Manning just minutes after taking someone’s life makes it a bit hard to like him and root for him as a hero. Heroes should value life, period, even the lives of idiot drug dealers. For this reason it’s important that we later see Neeson showing kindness toward the son of Viking, the film’s villain. This son character is by far my favorite character in the movie. It’s almost impossible not to like this character. His father is a vicious, narcissistic drug lord, and the poor kid is forced to split time between his divorced parents. When he’s with his dad, he’s taken care of by killer thugs. Yet this kid, in addition to being brilliant, has a wisdom and a sweetness of disposition that is almost jarring given the sordid characters all around him. I had a different feeling about this film. It’s as if Taken had been written and directed by Wes Anderson, only really badly. Or for another comparison, a very bad rendition of Fargo. The problem in my mind is Liam Neeson. He plays this role very straight as if he were in a multiverse version of Taken. There’s no whimsey in this character. And it’s a stark departure from the villain character Viking who is over-the-top goofy. And then Viking is taken down a peg by his American Indian ex-wife who grabs his nuts in a sort of Looney Toons way. (I mean, any self-respecting crime lord would have had her killed). I couldn’t reconcile the serious elements of this film with the caricatures into a dark comedy. It just didn’t add up for me. Like you, I thought the heroes in this film were muddied. On the one hand, we have Coxman who is a vigilante. Then Viking, the clear villain. Add in the American Indian drug lord (White Bull) whose son was killed mistakenly by Viking’s men – and is now out for revenge and doesn’t mind killing anyone who gets in his way. In the final scene, we see Coxman and White Bull driving off into the sunset together – as one of White Bull’s men gets diced into bits by Coxman’s plow. So… are Coxman and White Bull the victorious fathers who have their revenge on the man responsible for their sons’ deaths? I don’t know. The message of this film is all over the map as is the dramedy. 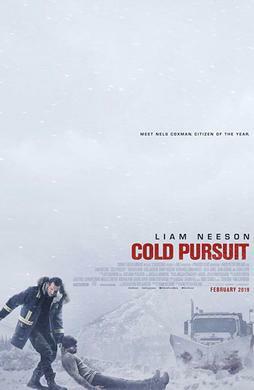 Cold Pursuit is another worthy installment in the Liam Neeson action movie franchise – which isn’t a franchise because he’s always playing different characters, but it is a franchise because these characters are all interchangeable. Cold Pursuit is more clever than the average Neeson movie because it knows how morbidly ridiculous it is. Although the film covers no new ground, it is entertaining nevertheless. I award it 3 Reels out of 5. There is a clear hero’s journey here, beginning with Coxman’s discovery of his son’s death. This news hurls him into the dangerous world of murderous drug cartels, where he must acquire the courage and resilience needed to acquire the truth about his son’s death. I’m not convinced that Coxman undergoes any significant transformation. 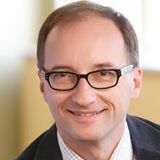 He seems motivated to clear his son’s good name, which he does, and he seems motivated to deliver justice, which he does. The journey seems a bit stunted to me, and for that reason, I can only give him 2 Hero points out of 5. I agree, Greg, that it’s not clear what this film’s message is. Could it be that we’re supposed to learn that revenge pays off? Or that crime doesn’t pay? I think Laura Dern’s message is that she shouldn’t have agreed to be in this film. She plays a throwaway character. Maybe the message is that we’re supposed to look out for family members even when they’re dead. I give the message 2 Message points out of 5. I didn’t really have a good time in Cold Pursuit. I was confused about its goals as a dark comedy, or a parody, or crime drama. I guess I need my stories to be on one side or the other of the comedy barrier. I give Cold Pursuit just 2 out of 5 Reels. Coxman is a vigilante with a heart. I can’t say I can warm up to any man who avenges his son’s life by abducting a child and putting him in harm’s way. I don’t think Coxman has any sort of transformation in this film – except from stoic everyman to stoic murderer. I don’t have any sympathy for this guy. Coxman gets 1 Hero out of 5. The only message from this film is “WTF is this movie about?” It’s a weak approximation of the other films we’ve mentioned in this review already (Taken, Fargo). I’m going to risk only 1 Message point out of 5 for Cold Pursuit.